Brother-sister duo The Knife released one of 2006’s most-acclaimed LPs in the guise of their third album proper, Silent Shout. Rightly ranking highly in DiS’s own run-down of last year’s finest, the album earned itself a re-release in July 2007 as an Audio Visual Experience; this version – a triple-disc CD and DVD affair – featured a full concert captured on DVD. It opened the eyes of those yet to experience the Swedes in their unnatural environment: truly, The Knife in the live environment is a rare beast indeed. 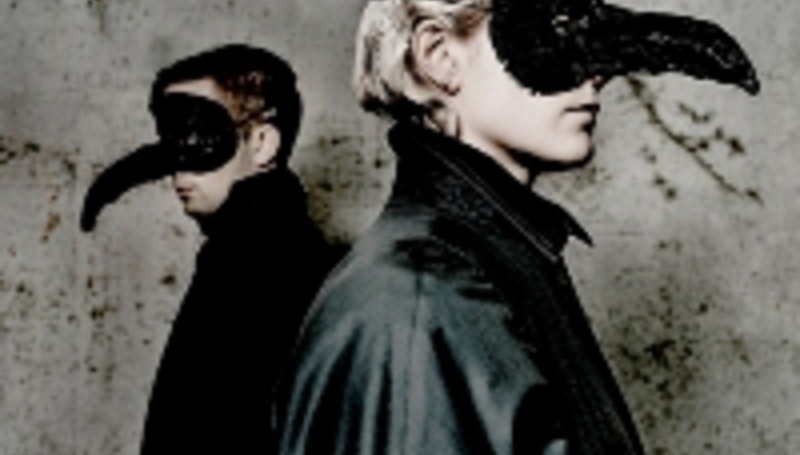 Siblings Karin Dreijer Andersson *and *Olof Dreijer dwelled upon how to present their music live for some time – while their self-titled debut came out on 2001, the pair didn’t perform live for some time afterwards; now, when they do, a regular, everyday experience it most certainly is not. Masks on faces, the pair dance about a landscape from the very wildest fantasy, imagined by Andreas Nilsson; art and music collides with some surreal sense of synergy. Their music – enticingly alien as it is – suits this otherworldly extravagance: the DVD of their April 12, 2006 show in Gothenburg finds them at their unique best, and is available now through Brille. DiS was fortunate enough to be granted a rare opportunity to talk to Karin about the re-issued Silent Shout and its accompanying An Audio Visual Experience DVD. It took us years to even consider making a performance, and after that, months of preparation. We did 22 shows in 2006, and after that we quit. I think Andreas Nilsson visuals and scenery is well worth watching, and it makes the music experience bigger. That's why we made the DVD. It also feels good to gather everything we did around the album on one place, so that we now can go on and work with new stuff. The Knife have earned something of a reputation for being frosty towards the media – not accepting awards, etc. Do you think that the band's profile, particularly since (second LP) Deep Cuts achieved worldwide recognition, has stood in the way of having this stand-off approach to press/attention perceived as a display of integrity? Acts of a lower profile would undoubtedly be celebrated for their careful courting with the media, but there's a feeling, certainly in the UK, that The Knife take this stance to irritate as much as to preserve integrity. I think it's important to make priorities. What's most important: travelling around, doing interviews and attending awards, or working in the studio? For us it's very clear. We like the 9-to-5 work, making music in our studios. And we also have families to take care of. The live shows – just how much time goes into the planning and preparation of live events? Are projections/animations specially commissioned, or does the band explore existing material and source art for live purposes? There are projections both before and behind the performers – is this important to you, to have the performers ‘consumed’ by what's about them, to become a singular 'being', if you will? Olof and I asked Andreas Nilsson if he wanted to come up with a visual idea of a live show, about six months before the premiere. We had a few regulations: we wanted to be hidden, wear masks and focus shouldn't be on ourselves. Andreas started to create new material, but he was also using clips and parts from videos he had already made for us. He collaborated with some other artist friends too, to create the dolls for the stage for example. A lot of people were involved in the production. Olof and I got very happy when Andreas' visual interpretation of our music worked so well. After about ten shows we even started to change things, in the videos and on stage. We had a set-up with six different dolls, I think, so that we could build the scenery out from the different stage sizes. And we tried new neon-black-light make up, which was very interesting. Adjectives like 'glacial', 'icy' and the like pepper critical coverage of The Knife releases – is this a product of where you're from geographically, or does The Knife set out to sound somewhat otherworldly, a little alien? Are you directly informed by the environment you create your music in, and does this then transfer to the live show – does the live show reflect the process of song writing, and the assimilation of myriad, often disparate, influences? Are you as influenced by art – art of a non-musical nature – as you are any musician peers? I can't speak for Olof about influences. But I watch a lot of film, good, bad, commercial and very indie. I think I am very eclectic in my taste; it's a matter of what state I'm in. At the moment I'm watching Twin Peaks again, and Trailer Park Boys again, at the same time. Both are favourites. I actually don't listen that much to music. When I work on my own it's a lot of sounds, anyway. I think both of us listen to music more like a reference nowadays: you want to check out what people been doing lately, new sounds et cetera. So I listen to a lot,_ once_. Since we're brought up in Sweden we are used to having space. And it's a big country with very few people in it, so you get a lot of it. Maybe you can hear that in the music, the desertedness and the frustration of being alone. It's hard to say what will happen next time, if there will be any next time. I see everything we have done as different projects, where we wanted to try new things. The live thing was a project, and I am not sure we will do it once again, since we now know what it's like. Until today, Olof and I have always started with the music. And when we've been done with it, we have started to talk about album cover, videos et cetera. Even if we have visual ideas along the music making, we try to put these aside, ‘cause you don't want to limit the music in any way. When we have tried to work out from themes, it has always ended up too bad, and the song's been deleted in the end. We try to avoid a lot of exploitation but I don't think we're that strict. When you have finished an album, and the songs can't be influenced or changed by any outside force, then I think it can be okay for them to be used in different channels, as we need money to continue to work. There are so many media channels nowadays that are commercial in some sense, so it's hard to avoid it. In Sweden, for example, it's only public TV that doesn't have adverts, but they almost don't show any videos and the public radio is so commercial anyway so they don't play our music. I don't know what will happen in the future, but at the moment this is where we stand. Running your own label as you do, I'm guessing this must give you almost complete control over your material in your domestic market. However, abroad you are signed to various labels – are you hands-on with these people, those you look after your interests overseas? Are you keen to guide how The Knife are perceived, perhaps to avoid any impressions_ a la _those outlined in question two? We try to work with labels that we think understand, or at least try to understand, how we want to work and do things. It can be a bit hard, since we don't know much about releasing records outside Sweden and there are big cultural differences. We have a very good management who guides the labels though and you learn a lot for every album. Are promo videos – short-forms for music television – as important to you as the visuals that characterise the band's live performances? Given your general stay-away attitude to the press – you're rarely seen without make-up, or masks of some kind – is it important that some of the band's individualist spirit informs the videos, which I assume are not made by you, but commissioned. It depends who's making the videos. When we have asked a video director to make his own interpretation of our music, it can end up in a very different way than we thought about it in the first place. That can be a very interesting process. It's of course easier when we work with somebody that we know well, like Andreas, who's made both videos and the live visuals. But I don't know the importance of any of them – that’s an unnecessary word, I think. We do the videos and live shows for fun, and it's a possibility to investigate collaborations with other artists. For curiosity. Lastly, do you see the disciplines of audio and visual coming closer together than they are already? Video didn't quite kill the radio star, but in these days of fast-access internet and online 'television' channels, anyone can access a band's video. Indeed, it's easier to see a video than it is to hear the audio-only song, often. Will bands become more aware of the importance of visuals, beyond simple band-lip-synchs style videos? Is it important to have almost total control over what's being made to promote you, visually? Visual arts, film, photos et cetera are big interests of ours, and that's why we also like to control how we are presented visually. It's not important to make a video, but if it's made, it's important how it's done, that it has the same spirit as the music. That, of course, is a very subjective thing: Olof and I are the only ones to tell. Still the most important visual part, as I see it, is the album package. But I am also very old. The Knife’s Silent Shout: An Audio Visual Experience is out now through Brille. Their MySpace page can be found here.